Brief Synopsis – Musical about King Arthur’s reign in England where he created the Knights of the Round Table and the love affair between Arthur, his wife Guinevere and his best friend Lancelot. My Take on it – This is a film that I have been interested in seeing for quite some time but the fact that it has a 3 hour run time has kept me away for a while. This series has given me the opportunity to finally see what this film is all about. Unfortunately, the 3 hour run time hinders instead of helps this film because it drags along way too much. The story that this film is based on is an interesting one yet they don’t manage to present things well enough here in order to keep the story interesting. 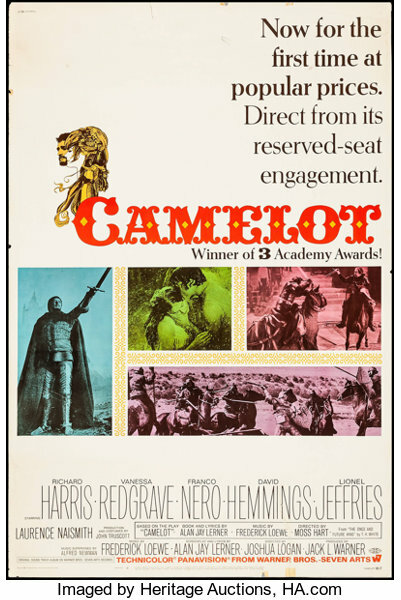 Richard Harris and Vanessa Redgrave are both fine here in the lead roles, but neither of them gives a stellar performance which hurts any impact that this story should have. They lack much chemistry between them and between Franco Nero who plays Lancelot which is problematic since this is essential meant to be a love story based on this love triangle. Even though this film is over three hours long, it lacks any real focus and moves around too much to be really effective. As a musical, the soundtrack is adequate yet it also doesn’t have any really inspiring of powerful songs. Bottom Line – Overlong musical that takes an interesting story and guts it by dragging it out too much. Harris and Redgrave are both fine here but neither stands out which takes away from letting this film have any real impact. The chemistry between the various characters is almost non-existent and that also hurts this story since its mostly meant to be a love story. Despite it’s three hour runtime, the film fails to stay focused enough and doesn’t manage to work well at all. The soundtrack is ok but again, doesn’t feel inspiring enough.